St. Euphrasia School is a Catholic community dedicated to nurturing each student’s faith, values, and stewardship while developing the academic achievement of all learners. We are an intrinsic part of the parish community’s Catholic education ministry. As facilitators of learning, we recognize the role of parents as the primary educators of their children. We provide an educational program that is sufficiently varied and flexible to foster the development of the whole person. 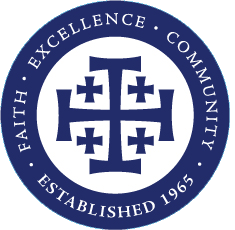 St. Euphrasia School Elementary School is fully accredited by the Western Catholic Education Association and the Western Association of Schools and Colleges in recognition for the quality of our educational program and strong Catholic Identity. Our school is fully accredited through June, 2023. Our last full accreditation site visit took place in 2017. At that time, our school earned the highest possible rating (“Highly Effective”) in all 12 categories. We are proud of our 50+ year history of student faith formation and academic excellence. We educate SAINTS & SCHOLARS! WE BELIEVE IN RESPECTING OURSELVES AND OTHERS – We are loving and kind to others. We live a healthy lifestyle. We value cultural diversity. WE BELIEVE THERE IS A SCHOLAR IN EACH OF US – We are in charge of our learning. We observe, we think, we do. We use technology as a tool for learning. WE BELIEVE IN THE RIGHT TO LIVE IN A PEACEFUL ENVIRONMENT – We work to be like Jesus in our thoughts and actions. We solve our problems with respect. We pray every day as Jesus taught. WE BELIEVE IN THE GIFTS AND VALUE OF GOD’S CREATION – We are happy that God created us. We take care of the Earth. We share our gifts and give to those in need. Are you looking for a faith filled community for your child’s education? WE EDUCATE SAINTS AND SCHOLARS: Weekly School Mass is celebrated on Fridays at 8:15. Students are responsible for various roles of the Mass (ushers, lectors, choir) and this time is a cherished tradition of our Faith. The students in Grades 6-8 are introduced to our parish youth ministry programs through the STEMS (St. Euphrasia Middle School) Connexions Youth Ministry Program. Our parish Youth Ministry Director is Ms. Jazmin Lugo (who is an alumni of our school). Are you looking for a science technology emphasis for your child? WE PREPARE LEARNERS FOR THE 21ST CENTURY: St. Euphrasia proudly implements a STREAM curriculum which integrates Science, Technology, Religion/Reading, Engineering, Arts/Athletics and Math/Music. Our school is currently fielding two robotics teams (a 5th/6th grade team and a 7th/8th grade team). We compete in the First Lego League competitions yearly. During the 2015-16 year, our team placed 15th out of 300 teams! At a recent competition this past October, our team scored 1st place. The team is sponsored and mentored by Boeing, Corp. We are one of the few elementary schools in our local area that can claim a corporate sponsorship through Boeing and we are grateful for their generosity and coach mentors. Students also have instruction in music, visual art and theater arts. We want every student to “share their gifts and talents”. Do you want to know more about a student’s academic journey? WE PREPARE LEARNERS FOR A COLLEGE UNIVERSITY PATH: We have a 100% acceptance rate into our area Catholic high schools (our graduates are accepted at Bishop Alemany, Notre Dame, Providence, St. Francis, Loyola, Chaminade, Louisville, Crespi, Flintridge Sacred Heart, Immaculate Mary, Sierra Canyon and Harvard Westlake). At our local public charter high school, Granada Charter High School, the Class of 2012 (graduating high school seniors in 2016) celebrated 99% of their class receiving academic honors awards at the graduation ceremony. We are proud of our academic excellence! St. Euphrasia alumni have attended UCLA, USC, Stanford, Georgetown, Brown, MIT, John Hopkins, NYU, UCSD, UC Irvine, Texas A & M, UC Davis, UC Irvine, and many more. The foundation for a 4 year university path started in their elementary school years. Do you want to know about our school enrichment and Knights Club (before and after school care) programs? WE WANT EVERY STUDENT TO BE PART OF OUR COMMUNITY BY SHARING THEIR GOD-GIVEN GIFTS AND TALENTS: After school sports programs include flag football, basketball, volleyball, softball, soccer, swimming and cheer for students in Gr. 5-8. Classes are offered in Art/Drawing. Hip Hop, Spanish, Math Enrichment (Sylvan), Robotics, Tennis, and Tumbling/Cheer. Students in Gr. 6-8 can try out for the Academic Junior High Decathlon Team (AJHD). Do you remember your elementary school journey and traditions? WE BUILD COMMUNITY AND RESPONSIBILITY: We celebrate many annual events, building community and continuing our 50+ year legacy. These include Harvest Festival, Christmas Program, Auction & Casino Night, Grandparents Day, Lip Sync, Class Field Trips, Las Posadas, May Crowning, Sports Banquets, Honor Roll Assemblies, First Friday Student of the Month Awards, Jog-A-Thon, Jump/Hoops for Heart and many more! St. Euphrasia is an intimate and friendly school, located in a safe and pleasant community. Multicultural and ethnically diverse, it provides an outstanding center of life and learning from Transitional Kindergarten through 8th grade. The curriculum exceeds California State standards and our school consistently scores well above grade level on standardized testing. We are very proud of the academic paths that our students continue to follow after graduating from St. Euphrasia, exceling in high schools across Los Angeles. Every member of the graduating class were successfully admitted to their first choice high school, and 25% of them were accepted with Honors and/or Scholarships. And the academic journey doesn’t end there. Upon high school graduation, our students are regularly accepted at prestigious universities and colleges across the United States. © 2019 St. Euphrasia School. Site by Gradelink.